This week an approval panel from the University of Brighton in the UK, led by Dr Paul Frost, Director of the Hastings Campus of the University of Brighton, visited Wittenborg University in Apeldoorn for an approval event of the Bachelor International Hospitality Management. The programme, already validated by the University of Brighton leads to a UK Bachelor Hons degree. The programme is a 3-year programme, and is offered in Apeldoorn as part of the IBA Hospitality Management Bachelor programmes, accredited by the NVAO and the German, Austrian and Swiss FIBAA. The Panel fully approved Wittenborg to offer the programme, both in the form of a joint delivery, where students spend the first semester of the final year in the UK and the second at Wittenborg in Apeldoorn, and for a shared delivery format in which the full final year is studied in Apeldoorn. This means that both regular IBA Hospitality Management students and the EuroBA students will be eligible for the double degree, if they pass the full 240 credits of the normal programme. The panel only had one condition, regarding the date by which teaching staff should be planned into the programme, and a number of recommendations, including a specific HRM staff retention policy. Furthermore, the panel had a list of commendations about the facilities, the staffing policy, the student support and the very positive atmosphere they found within Wittenborg. 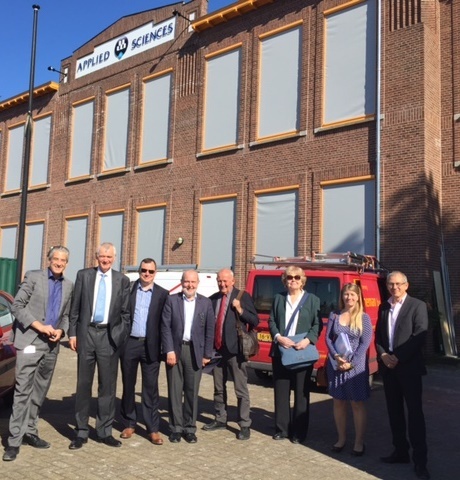 The panel who toured the new Spoorstraat building, still under renovation, were extremely impressed by the new facility. The double degree in International Hospitality Management will start on 31st August. Now, for the first time, a Bachelor programme will also be jointly delivered by Wittenborg and Brighton. Asked about the rationale behind the validation and aproval of delivery of the BA (Hons) in International Hospitality Management (IHM), Wittenborg’s Academic Dean, Dr Jacques Kaat, said it benchmarks the programme against similar hospitality programmes in the Netherlands and also puts it on par with highly reputed UK standards in education. Currently Wittenborg’s IBA in Hospitality Management is delivered as one of Broad Bachelor in Business Administration (BBA) programmes with a specialization in hospitality management. “Now, however, it will have its own identity,” Kaat added. The proposed arrangements for the BA IHM form part of a wider set of partnerships associated with Brighton’s European Bachelor Programme in Hospitality Management. The so-called EuroBA allows for students to complete each year of their studies at a range of institutions in Europe – including Wittenborg in the Netherlands, ANGELL Akademie in Germany, Gallicia Hotel Management School in Spain, Ecole Superiere Internationale de Savignac in France and Brighton’s School of Sport and Service Management. Level 6 of the curriculum – Brighton’s BA IHM top up, which will see graduates credited with a BA (Hons) degree – will in terms of the new validation proposal be delivered at Brighton in Semester 1 and at Wittenborg during Semester 2.